Teamwork is the heart and soul of a company, organization, family or relationship. Groups are comprised of individuals; and individual drive, skills and motivation are essential to the success of the group. But it's the spirit of teamwork that breathes life and creativity into your organization. A key role of every leader is to continually build teamwork within her or his organization. Unfortunately, most managers and supervisors unwittingly sabotage their own team-building efforts on a daily basis through a lack of awareness. Our team-building workshops are designed to create a new level of teamwork awareness, not only in management, but in every member of your team. ...or all of the above. Our workshops range from a short one-hour program that can be included in an already-scheduled meeting or conference, to a dedicated, multiple-day event. Our team-building workshops build the spirit of teamwork by creating a teamwork experience in a different context. The daily routine of work is generally focused on the tasks at hand. Employees often get stressed out or stuck in task-focused habit patterns that cause them to lose sight the value of teamwork. When interpersonal conflicts arise, they get defensive and act in ways that break down teamwork. When managers and supervisors consistently do this, it ripples through the organization and de-motivates the entire team. The team needs a change of context. You can schedule your team-building workshop on-site or in an off-site location, such as a nearby (or not so nearby) hotel, resort or meeting facility. We work with you to plan the details, and we provide the training, facilitation and tea- building activities. By getting everyone out of the daily work context and into a new, teamwork-focused context, we create a powerful experience that results in a new level of teamwork awareness and organizational change. There's no question about it, our team-building workshops are fun! Regardless of the size of your group, we will facilitate creative team activities that are guaranteed to elicit laughter, fun and enjoyment. But there's a purpose behind everything we do: building the spirit of teamwork. Every activity is followed by an interactive debrief, during which we discuss what happened during the experience and how it relates to teamwork in the workplace. Activities, discussions and training are seamlessly blended together to make your workshop an effective catalyst for change. You can train people in the principles of teamwork, and we certainly do that. 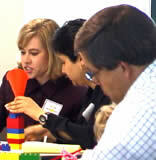 But our workshops go much deeper than typical classroom training. We immerse your people in a team-building experience. Team members get to know each other in new ways, and new connections are formed. The assessments and exercises open new dimensions of understanding and empathy. Participants gain deep insights about teamwork, through the fun, activities, training and team interaction, that would not be possible through simply being exposed to new information about teamwork. We provide the tools to help your managers and supervisors keep the spirit of teamwork growing within your organization. Contact us today for more information about our programs and a free team-building consultation. Team-building is what effective leaders do every day. They do it because they are aware of the value of teamwork, and they see how their attitudes and actions either build teamwork or break it down. When every member of your team becomes an effective leader, teamwork flourishes. Team-building requires awareness, and awareness requires action. Take action and schedule a team building workshop for your team now!